This year's Fiesta con Sabor honorees in Newark, left to right: Guillermo Artiles '12, Hon. Jose Linares, Lillian Plata '02, and Luis Diaz '87. Rutgers Law students in both Newark and Camden celebrated the achievements of Hispanic lawyers and leaders at two annual banquets held this spring. 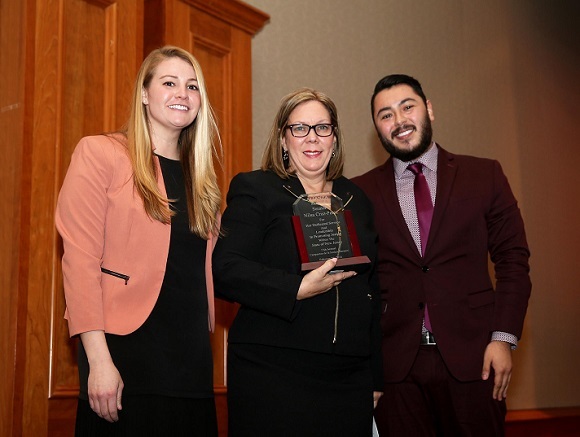 In Camden, the 15th annual Defensores de la Justicia Banquet by Alianza, the Latino Law Students Association of Rutgers School of Law, Camden was held in February. The banquet honored Senator Nilsa Cruz-Perez of NJ's 5th Legislative District and New Jersey's first elected Hispanic woman state legislator; and Rutgers Law School Professor Joanne Gottesman, Director of the Immigrant Justice Clinic. "As an Immigrant Justice Clinic student and President of Alianza, I could not have been more proud to stand in a room full of alumni of our organization, special guests, and the Rutgers Law community to celebrate our honorees and scholarship recipients," said Julie Peterson ’18. "Alianza is like a family and the atmosphere of the banquet was supportive and uplifting." The Carmen M. Garcia Bright Futures Award, named for Alianza founder Hon. Carmen M. Garcia, was also given to two high school seniors from Camden. New Jersey State Senator Nilsa Cruz-Perez, center, receiving her award. In Newark, The Association of Latin American Law Students (ALALS) held its annual Fiesta con Sabor on March 8. This year's honorees included, Guillermo Artiles '12, associate council for the Office of Governor Phil Murphy; Jose Linares, Chief Judge of the U.S. District Court Judge in New Jersey; Lillian Plata '02, founding member of the law firm Nee Plata and a member of the Board of Directors for the Don Pedro Development Corporation; and Luis Diaz '87, General Counsel and Chief Cybersecurity Officer for Vision-E. The event is also a scholarship fundraiser that featured dining and dancing in the Center for Law and Justice atrium.